Glenna Housman and her family. Photo courtesy of Housman family. This post was originally published on Red Cross Chat and is published on this blog with permission. The recent tornadoes in Illinois are a sober reminder that disasters happen anytime and anywhere. In the Upper Midwest, we experience heavy storms, flooding, and tornadoes. During Severe Weather Awareness Week, April 13-17, take a moment, or two, and review your preparedness plan; check-in with loved ones, neighbors, and friends about their readiness for emergencies; and update your disaster kit so that you’ll have what you need when you need it most. To get more Red Cross safety information for specific emergencies, click here. We encourage everyone with mobile device to download the Red Cross Tornado App. This free app features a siren warning, a shelter locator, and instructions on what to do during and after a tornado. Information is available even if there is no mobile connectivity. You can also learn more about tornado safety by viewing this myths and facts slide show. To help people affected affected by disasters big and small, click here. 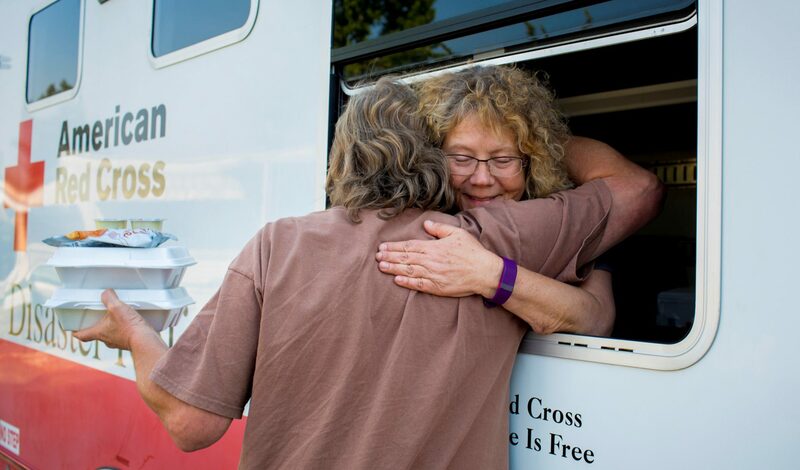 Your gift enables the American Red Cross to prepare for, respond to and help people recover from disasters. You can donate by visiting redcross.org, calling 1-800-RED CROSS or texting the word REDCROSS to 90999 to make a $10 donation. Your donation helps provide food, shelter and emotional support to those affected by disasters. The Monster Guard: Prepare for Emergencies App provides 7-to-11 year-olds a fun, gaming environment to learn how to prevent emergencies, like home fires, and what to do if severe weather or natural disasters occur. Using the app is an exciting way for children to learn, practice the lessons and share the information with family and friends. The Red Cross worked with Disney to develop the “Mickey and Friends Disaster Preparedness Activity Book.” The book teaches children and families how to prepare for and respond to a wide range of disasters and emergencies through interactive games and activities. The book is available to download in English and in Spanish. Other Red Cross emergency preparedness apps contain a ‘Make a Plan’ feature that allows users to create their plan and share it with their loved ones. A Family Disaster Plan Template is available to download. What are your 2015 resolutions? Losing weight? Yep. Eating healthy? For sure. Preparing for emergencies? Um, no, you’d not thought of that, right? We ask that you do because we see every day the impact disasters–mostly house fires–have on people. So, below are 12 actions, one for each month, that you can take to become more prepared by the end of 2015! Download a Red Cross mobile app. Learn about how to prevent fires in your kitchen (the number one cause of house fires). 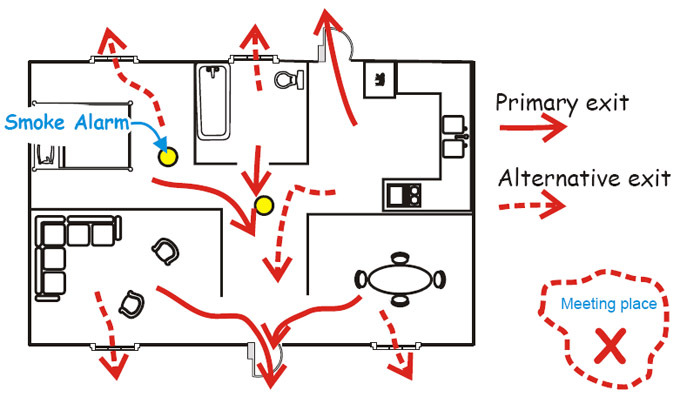 Talk with your family about having two ways out of every room in the house to ensure that each of you knows how to get out in case of a fire. Make a disaster plan with your family. By having a disaster plan each member of your family will know where to go if there is a disaster as well as having other important information on hand. Check your smoke detectors twice a year to ensure that they are in working condition. Complete the home fire preparedness checklist. Build a disaster kit, so you have the items you would need in case you have to evacuate. Learn how to prepare for members of your family with special needs like children, pets, individuals with disabilities and seniors. 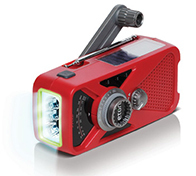 Purchase a weather radio so you can be informed during weather related disasters. Learn about the weather warning systems and what each warning means. Put together a car kit that has items you might need if you get stuck during a winter storm. Tell your family and friends about the importance of being prepared and challenge them to take the steps above. Report back about your success as you move forward. Want additional guidance? We’re here for you. Call us at (612) 871-7676 and ask for Jenn in Disaster Cycle Services. As Red Crossers, we know disasters can strike at any moment and being prepared before they happen is vital for reducing their impact. We also know the most effective way to engage people with disaster preparedness is for them to hear the message from someone they know. So, this holiday season we ask you to take the steps below and show your loved ones that you care by helping them prepare for emergencies. Take 30 minutes to talk through your family disaster plan with household members and that everyone has the same understanding of what to do if there is a disaster. Once your plan is complete, share with others outside your household the importance of being Red Cross Ready and having a family disaster plan, a disaster kit and downloading the free Red Cross First Aid App to their mobile device. You can use this list of disaster preparedness talking points to get the conversations started. Keep track of the people you talk with here. There will be a prize for the person who has the most conversations about disaster preparedness between now and January 2! As a friend, neighbor, community member and Red Crosser, this is a great chance to join together and educate your neighbors, friends and family members about a topic that is very important. For additional preparedness materials and support, contact Jenn Hamrick at 612-604-3290 or jenn.hamrick@redcross.org.